A lot of the attractiveness of Chaparral has to do with mystique: the clandestine connection with a huge automotive power, folkloristic things like the "vegetable van", the numerous "who was first" issues, the automatic gearbox which wasn't an automatic gearbox really, always lots of pre-season rumours, Jim Hall's attitude "I suppose there will always be this little Chaparral secrets", and journalists complained that getting information out of Midland was as difficult as stealing gold from Fort Knox. Over the years a lot of answers occurred but at the same time a lot of questions raised again. That's why The Chaparral Files starts this new initiative: visitors are encouraged to bring in questions and I hope that other visitors (please Chaparral Chaps from the past and present) are able and willing to resolve these mysteries once and for all! 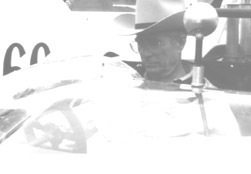 Chuck Pelly penned the Chaparral 1. Paul Lamar claims he designed the aerodynamics of the 2F. But who did the actual styling of the 2F and all the other "2-series" Chaparrals? Did an autoclave oven exist at Rattlesnake Raceway at the time of production of the 2H or was the chassis baked at Chevrolet in Detroit? What happened to Hap Sharp since he was bought out and in the end committed suicide? What happened to the remains of the "Chaparral" F 5000? Where and what is the "I" between the 2H and the 2J? Was the I the crude Chevrolet device that came to Midland and became the 2J?